Like we were saying, OnePlus has opted to include the standard Google app suite in the handset, but also hasn't skipped on developing a few basic apps itself. The Gallery app is one of them. You can just as easily browse your photos and videos through Google Photos of even the Files app, but Gallery also acts as the only built-in video player. Available video decoders include Xvid, DivX, H.263, H.264 AVC (MKV files), and MPEG-4. The app will play most major file formats, though serious video fans should certainly seek out a more capable solution from the Google Play, as the lack of AC3 audio support is quite limiting. Subtitles aren't supported either. The photo app also gives you a number of options. You can share stills, set them as wallpaper or contact photos, or edit them. The built-in Photos editor is incredibly powerful too. As for music playback, again there are two options. The default Oxygen OS Music app is rather basic, but it does offer a few sorting options, as well as a bit more advanced things like tags and favorites. However, Google Play Music is still loaded on by default and it is a good thing too. It has come a long way and even if you don't intend to subscribe to Google's streaming service, it still offers bells and whistles like album art, powerful searching algorithms and also the neat ability to upload your own tracks to the cloud and stream them for free. Oddly enough, you can only access an equalizer from within Google Play Music. Also, it appears to be a lot simpler than the MaxxAudio one that was included in the OnePlus 2. There is no mention of Hi-Fi or any other advanced audio tech either. The OnePlus 3 went off to a flying start in our audio quality test. When used with an active external amplifier, it got top marks for clarity and had very high loudness for one of the more impressive showings out there. 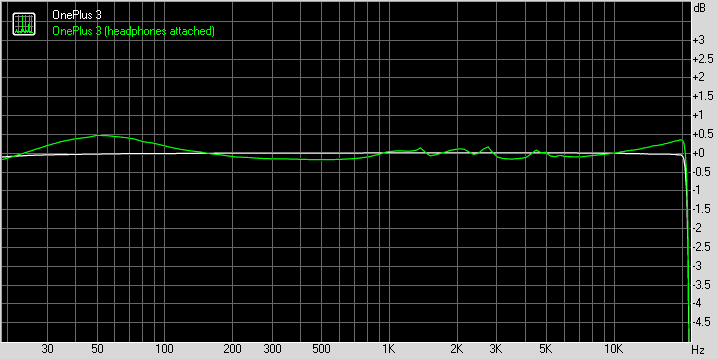 Unfortunately hooking our standard headphones set did quite a lot of damage - the loudness plummeted to only average, stereo crosstalk rose significantly and frequency response got a little shaky. Intermodulation distortion crept in too, so it's not the best in this case and certainly some way behind what we consider flagship standard in 2016. And now here go the results so you can do your comparison.